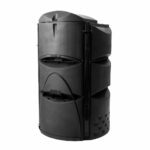 Mr.Spin® Compost Tumbler: 160 liters/43 gal. Dual Chamber compost tumbler on two-leg stand. 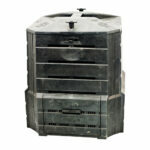 Two compartments to keep fresh organic waste from older waste – separation makes better compost. 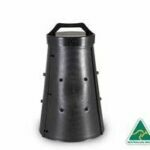 This most popular style tumbler is perfectly suited for small yards and for people not wanting to mix the organic waste in their traditional compost bins. 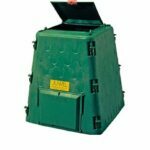 Simply turn t his bin and waste is mixed easily. Green access door for easier access. 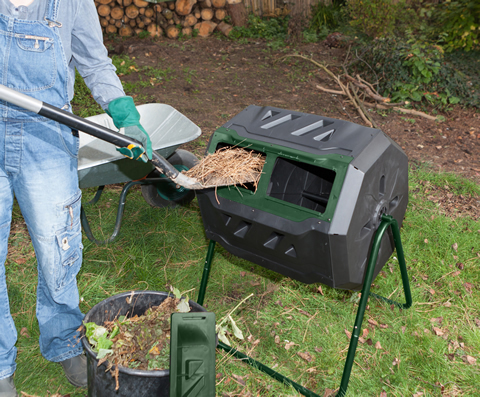 NOTE – this is a tumbling composter and not to be used with worms. Little tough to assemble. Seems to be working well but, have not had it long enough to see any compost. 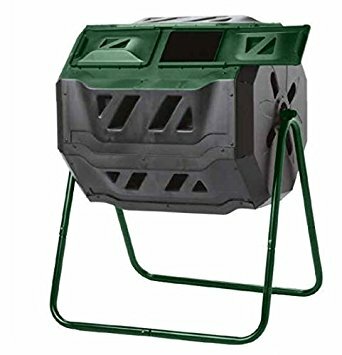 So this is a wonderful product and it was pretty easy to setup, but I put the live worms that I purchased into this bin and they all died. I understand why they died it was my fault, but it would be nice to add to the description of this product that "It shouldn't be used with worms"